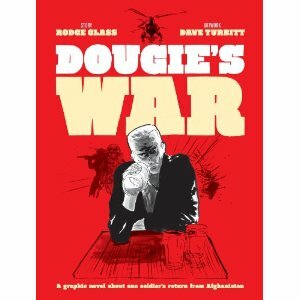 Described as “absolutely brilliant” the graphic novel Dougie’s War tells the story of Dougie Campbell, a veteran of the war in Afghanistan returning home to the south side of Glasgow. The novel focuses on Campbell’s return from the war and difficulty he faces adjusting to civilian life. Scottish veterans, David Cruickshanks and Shaun Davidson, both from Fife Veterans Association, launched the explosive new graphic novel at Edinburgh Castle. The graphic novel is the first release by independent Glasgow publishers Freight, written by acclaimed novelist and biographer Rodge Glass and illustrated by artist Dave Turbitt. Cruickshanks was approached by Rodge Glass to help him put the novel together. We chatted about what armed service veterans feel like when they come out of the services and about trying to integrate them back into the community when they’ve left. I was in the Navy so I came out of there into civilian life. I had an injury to my knee so I got a medical discharge and Rodge and I spoke about a character that would maybe do the same sort of thing. If the novel appeals to all different types of people, particularly younger people, then it helps to get the message across that people do suffer trauma when they come back from the services. It is hoped that the novel will shine a spotlight on Post Traumatic Stress Disorder (PTSD).